Bokashicycle Marijuana Granulating Machine - World Wide Shipping Rates! 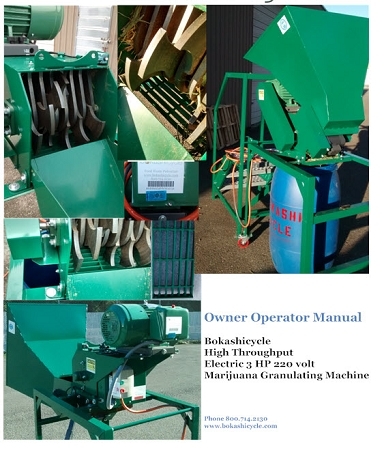 Bokashicycle’s Marijuana Waste Granulater is a machine specifically designed to efficiently and rapidly granulate and mince MJ waste materials including root balls. Growers and distributers who need to meet licensing requirements for waste disposal can meet virtually any waste disposal requirement with granulated materials. Growers who want to mix granulated waste with inert materials and then send that material off site under contract will meet their licensing requirements. Growers who want to compost their products on or off site can rapidly compost granulated materials. Growers who prefer to bokashi ferment their materials on or off site can also meet their regulatory license requirements with the granulated and inoculated end product. Bokashicycle provides to the grower a high throughput MJ granulating machine that plugs into any 220 volt standard outlet. This powerful 3 HP machine with an attached step-platform makes it easy to send all of the MJ waste directly into a 55 gallon barrel. A grower may choose to use cardboard cartons in place of barrels. The large hopper has a metering forward and reverse 220v motor to move waste into a granulating chamber where the waste will be immediately pulverized. Waste exits the granulating chamber quickly to fill the 55 gallon barrel after passing a filtering grid. Each full barrel will hold approximately 400 pounds of MJ waste. The Bokashicycle MJ GRANULATER was designed to make it easy to dispose of waste. The Hardox 450 blades, gates and filter grate mince and granulate waste so that bokashi microbes can very rapidly metabolize and ferment waste returning nutrients and flora to soil for recycling. Add a handful of bokashi culture mix to each 5 gallon bucket of waste and run it through the MJ GRANULATER. Move the machine to the side and seal the fermenter (55 gallon barrel) with the band clamp lid provided and the waste will be transformed into a bio pulp in approximately 10 days. Pathogens are destroyed in the fermenting process and there is no putrefaction or unpleasant odor, insects, or vermin to worry about. Rats will not be attracted to the fermented food waste. The fermented bio-pulp when tilled into soil will rapidly disappear. The soil where the bio-pulp is added will be much improved in nutrients and organic content and will be ready for planting within a few weeks after disc tilling to the soil. Your bio-pulp treated soil has more than twice the nutrient value of compost and most importantly expands in number and diversity important microbial organisms associated with healthy soils. The Bokashicycle MJ GRANULATER is designed for many different users. The 25 foot electric cord makes it easy to reach a 220 volt standard outlet. The machine can be operated either indoors or outside and rolls easily on 4 swivel wheels for easy positioning over a 55 gallon barrel or carton. This machine is designed with safety in mind. The hopper swings down easily allowing access to the granulating chamber. Most importantly, safety switches are activated any time the hopper is moved away from the granulating chamber so that no accidental start up can occur when the box is being inspected. The Bokashicycle MJ GRANULATER is ready to run immediately upon delivery. The 3 step-platform is assembled and the tread bolts are secured allowing access to the hopper. A standard 220 volt outlet within 25 feet of the machine is all that is needed then to start the operation. Galvanized tread and platform and powder coated heavy duty iron grip rails and supporting structure are weather tolerant finishes minimizing corrosion problems. Easily assembled and disassembled for shipping. 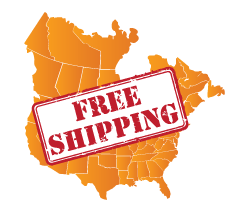 Call 800.714.2130 to place an order and request a quote with shipping charges.